Hurricane experts from the National Oceanic and Atmospheric Administration (NOAA) will visit five U.S. East Coast cities and one city in Canada, flying aboard a USAF Reserve WC-130J Hurricane Hunter aircraft along with the NOAA G-IV aircraft, to raise awareness of the impacts from tropical cyclones threats and the danger of being caught without a personal hurricane plan. One of the stops on the 2017 Hurricane Awareness Tour will be Raleigh, North Carolina. This stop will occur at Raleigh-Durham International Airport, on Wednesday, May 10, 2017. The WC-130J is one of ten such aircraft used by the U.S. Air Force Reservists from the 53rd Weather Reconnaissance Squadron, 403rd Wing, located at Keesler AFB in Biloxi, MS. Military air crews fly directly into the core of tropical cyclones to gather data that are critical for forecasting a tropical cyclone’s intensity and landfall. The NOAA G-IV is part of the agency’s fleet of highly specialized research and operational aircraft operated, managed, and maintained by the NOAA Office of Marine and Aviation Operations and based at Lakeland Linder Regional Airport in Lakeland, FL. It flies at high altitude around and ahead of the tropical cyclone, gathering critical data to go into the hurricane forecast models. National Hurricane Center Director Dr. Rick Knabb, hurricane specialists Daniel Brown and John Cangialosi, Hurricane Hunter mission specialist Warren Madden, the USAF hurricane hunter crew members, and the NOAA aircraft crew members will be on hand to educate residents of vulnerable communities about hurricane preparedness, and will be available for interviews. Staff from local emergency management offices, non-profit organizations such as the American Red Cross, and personnel from local NOAA National Weather Service forecast offices and Central Carolina SKYWARN will be part of the team at the RDU stop. Community groups, media, elected officials, select local schools (schools by invitation only), and the public are invited to participate and tour the aircraft and exhibits. Public tours will be given from 2:30 to 5 p.m.
For more information on the Raleigh event, contact Nick Petro of NWS Raleigh at 919-515-8209, ext. 223 or Nicholas.Petro@noaa.gov. SKYWARN Spotter Training will be offered on the CCS Information Net on April 4 & April 11 at 9:15 PM on the 146.88 repeater and via live-streaming audio on the internet. Training will focus on the role of the SKYWARN spotter, weather safety and convective basics. This training may be used to earn initial spotter certification or renew certification which is required every three years. Part 1 of Basic Training will be April 4 ; Part 2, April 11. The instructor will be Nick Petro WX3H, Warning Coordination Meteorologist with the Raleigh National Weather Service. C. email CCS Emergency Coordinator Virginia Enzor at nc4va@nc.rr.com with your name, call sign (if licensed), and preferred email address. The NWS will then contact you about completing the spotter certification process. Scanner listeners and listeners receiving live-streaming audio on the internet at www.broadcastify.com may also participate by downloading the presentations and emailing Virginia Enzor at nc4va@nc.rr.com immediately after both nets. Again, be sure to include your name, call sign (if licensed), and preferred email address. If you live outside the Raleigh NWS county warning area, the Raleigh NWS will coordinate with the appropriate Weather Forecast Office to ensure your SKYWARN spotter certification. Again, you must listen both night to complete the training. For a list of Spotter Training classes in central North Carolina, please visit www.weather.gov/raleigh/skywarn. The Raleigh National Weather Service has directed Central Carolina SKYWARN to activate for the pending Winter Weather event. We will activate today from 6pm to midnight and on Saturday from 6am to 6pm. We will run the SKYWARN activation net at the top of each hour on the 146.88 repeater. If needed, our first backup will be the 147.105 repeater with tone of 82.5 Hz. Secondary backup will be the 147.135 repeater with a tone of 82.5 Hz. Tertiary backup will be the Carolina 440 UHF Link System. *Location – Street/Cross street, city & county or lat/long. *Accumulation of snow/ice accretion (If you have both, you may report X number of inches of snow and x number of inches as sleet. If unsure how much of each, just report your total as combination of sleet and snow. *Impacts such as road conditions (particularly any roads that are closed or impassable, sustained power outages (not just blinking) and downed limbs/trees. It will NOT be necessary to report the intensity of precipitation, any changeovers or temperatures. Reports will also be accepted on the Central Carolina SKYWARN Facebook page. Your winter weather photos are welcome too! Thanks in advance spotters! Please stay warm and safe. December 11-17, 2016 has been declared Winter Weather Preparedness Week. To find lots of good information on winter weather preparedness, please visit winter weather safety! Weather Spotters get ready! SKYWARN Recognition Day 2016 officially takes place Saturday, December 3, from 0000-2400 UTC. 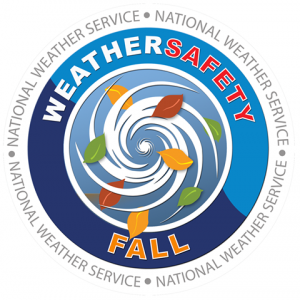 This annual event was originally developed in 1999 by the National Weather Service and the American Radio Relay League to celebrate the contributions that SKYWARN radio operators/spotters make to the National Weather Service. During a 24 hour period, SKYWARN operators visit NWS offices and contact other radio operators across the world. Central Carolina SKYWARN and the Raleigh National Weather Service, operating under the call sign WX4NC, will join in the fun on Friday night (December 2) from 7 -11 PM and Saturday from 8:00 AM to 5:00 PM, making contacts on the WB4TQD 146.88 repeater, the K4ITL 147.105 repeater, the K4ITL 147.135 repeater, the Carolina 440 UHF Link System, IRLP, Echolink (WX3H and WX4NC), and HF (20, 40 & 80 meters SSB). To find the specific HF frequencies, look for us on http://dxsummit.fi/#/ or ask a SKYWARN operator on the 146.880 repeater. There will be a special event certificate from the Raleigh National Weather/Central Carolina SKYWARN! Instructions for obtaining a 2016 SKYWARN Recognition Day Special Event Certificate from WX4NC can be found by going to www.weather.gov/raleigh/skywarn on December 3, 2016. The National Weather Service has directed Central Carolina SKYWARN to activate for a Flash Flood Warning, Severe Thunderstorm Watch/Warning, and Tornado Watch/Warning during Hurricane Matthew. The CCS NCO will announce appropriate watch/warning product and monitor the 146.88 repeater for reports. –At the end of the storm, please provide your rainfall total. SKYWARN will monitor the 146.88 repeater for spotter reports. Spotters may also post their reports to the Central Carolina SKYWARN Facebook page. This activation is live-streamed at www.broadcastify.com. Go to that URL, click on live audio. Then click on the map, click on North Carolina, then Wake County, then Central Carolina SKYWARN. 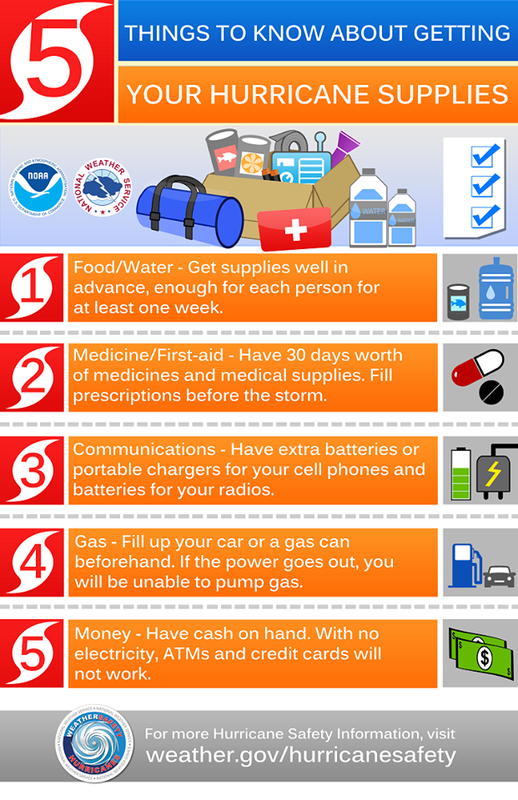 Now is the time to start preparing in the event that Hurricane Matthew affects our area. 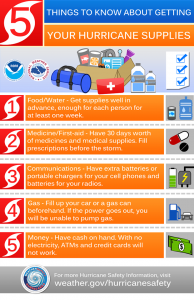 Check out these preparedness tips, and find more at weather.gov/hurricanesafety. Please share these tips with friends and family. Events like the recent flooding in Louisiana, Hurricane Hermine approaching Florida, and Hurricane Lester in the Gulf remind us that weather can change at a moment’s notice. Disasters don’t always occur when we are together with our family and friends, and so it’s important to take time now to plan what you will do in an emergency. It only takes a few minutes to talk through the greatest risks that can affect where you live, work or go to school. Stay Up-to-Date on Tropical Weather! As the days get shorter and temperatures fall, a new round of weather hazards are on the rise. 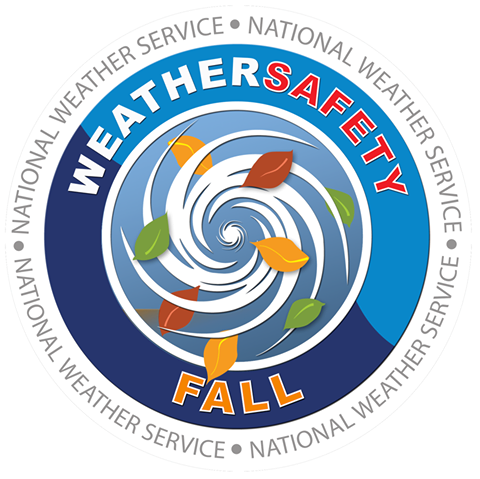 This transitional season often features weather hazards seen during both warm and cold months, including hurricanes, wildfires, intense winds, flooding, droughts, early season snow and more.